Sometimes simpler is better! And that goes for your holiday wreaths too. 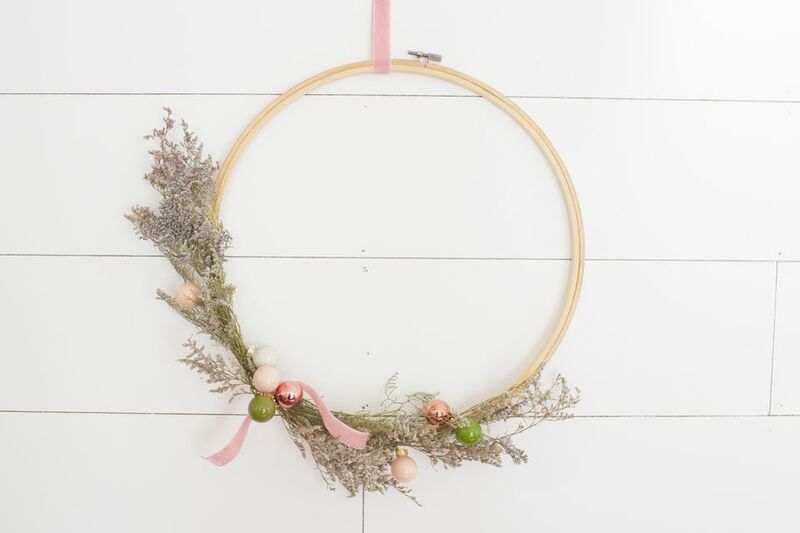 Foraged greens or dried flowers make a stunning base for this wreath built on an embroidery hoop. Because it's so simple, it takes no time at all to make and can stay up well past Christmas. And don't forget that Christmas colors can be broader than basic red and green. By utilizing pretty colors like pinks and greens, it allows you to extend holiday-specific decor into simply seasonal decorations. Here's how to make this beauty on your own. One of the really enjoyable parts of this project is foraging for materials. You never know what might available right in your own backyard! 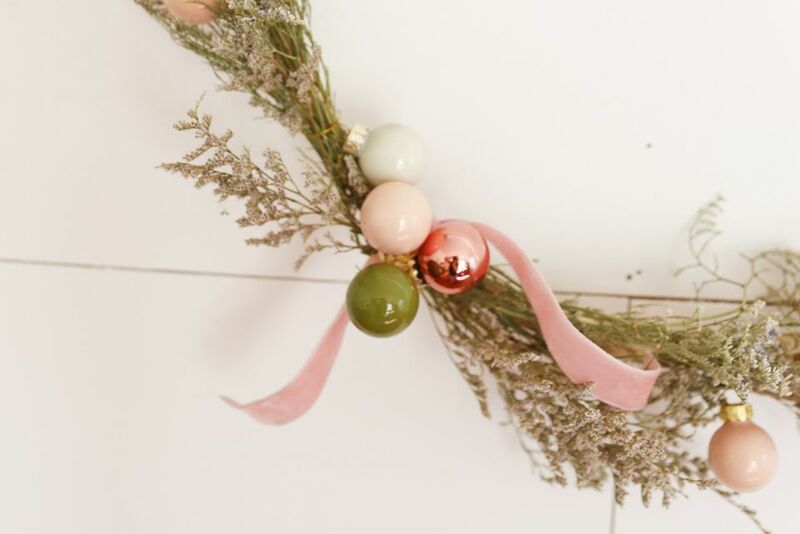 Evergreen branches, dried flowers, pinecones—use whatever looks good to you. And if you can't find anything you like outside, you can find some really beautiful options at your local craft supply store. We would suggest avoiding plastic materials because it looks a little too fake. Since you're starting with such a bare base, this type of wreath is a little more challenging to work with than a grapevine wreath. In a grapevine wreath, you can tuck small clippings inside the spaces between the branches, but here there is nowhere to hide or add branches. So you want to form your greenery in bunches off the wreath, first. Make it look good in your hand and then twist a very small piece of wire around the base and affix it to the embroidery hoop. See how it's sitting on the hoop—any stray pieces can be controlled by using another small piece of wire to hold it to the hoop. The important thing to remember with wreaths is layering. Next, you want to add color and texture in addition to the greenery to make the design feel complete. Plus, if you stopped after just the greenery, it would look sort of sad and you'd see all kinds of wire sticking out. We tied a velvet ribbon around the embroidery hoop to help cover some wire but also to add a bright pop of color where we want to add the baubles on next. Mini Christmas balls work best for this project because of the scale of the embroidery hoop. Group a few together, thinking about what colors you want to use in your wreath, and secure them with some wire. They will form a little cluster. Take the cluster and attach it to the wreath where you'd like it with a little bit of wire. Repeat as you'd like. It's also a nice touch to sprinkle individual balls throughout the wreath as needed. At this point, you can take smaller pieces of greenery and fill in any holes, gaps, or use it to hide wires that are peeking out. Add another piece of ribbon to the top to help hang it. While this design would look lovely on the front door, you can also hang it inside or in any corner that needs a little touch of holiday spirit.